Welcome to the Huron Remembers website. Here we remember and honour our Huron County Fallen from both world wars and the recent Afghanistan conflict. This website is meant to provide biographical material, background information and content for the many names etched into the stone monuments at our Huron County cenotaphs. Our Vision is to provide a website with content on each of the 716 Huron County war casualties found on local Huron County cenotaphs. This ambitious undertaking is meant to involve the families of our fallen, who have memorabilia, letters and pictures to share. Our goal is to provide a website that would connect our young people and our current generation to the extraordinary contribution made by Huron County residents for the cause of freedom. We hope to erect QR codes at each cenotaph to link visitors with the stories behind each of our fallen. Our project was inspired by the recent visit of Princess Margriet of the Netherlands to honour the Huron County 20 fallen in the battle to liberate the Netherlands. 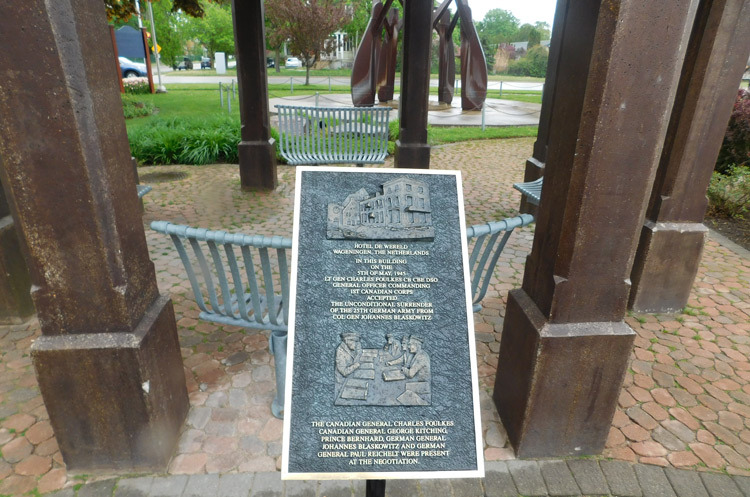 ( http://dutch-canadiansremember.ca ) Here is a picture of the plaque she laid in Goderich, May 14th, 2017 at Liberation Memorial Park. The Huron Remembers Committee invites you to work with us to contact local families of our fallen, gather biographical material, and encourage local awareness & support.